段睿, 焦奥, 张城硕, 林建贞, 石悦, 张佳林. 短肽FLPNF对地塞米松诱导的胰岛细胞凋亡的保护作用[J]. 中国医科大学学报, 2019, 48(3): 193-200. DUAN Rui, JIAO Ao, ZHANG Chengshuo, LIN Jianzhen, SHI Yue, ZHANG Jialin. 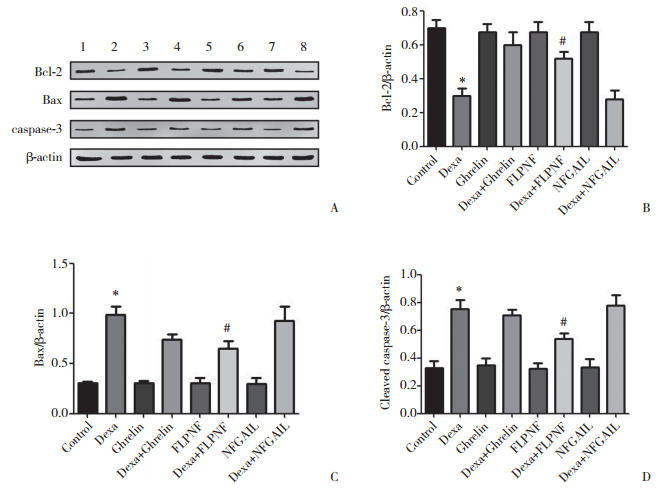 Protective Effect of Oligopeptide FLPNF on Dexamethasone-induced Apoptosis of Islet Cells[J]. Journal of China Medical University, 2019, 48(3): 193-200. Abstract: Objective To investigate the protective effect of FLPNF and the improvement of glucose-stimulated insulin secretion against dexamethasone-induced apoptosis of islet cells. 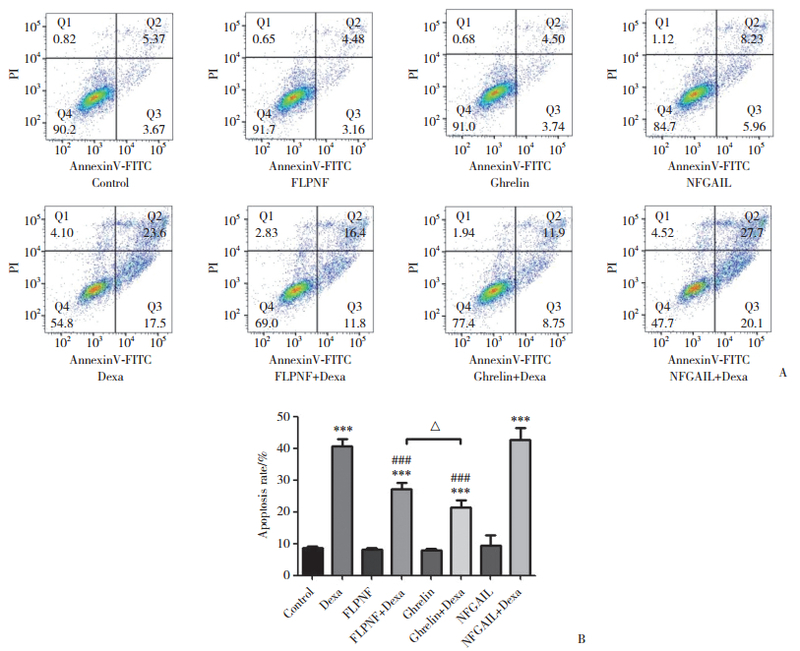 Methods INS-1 cells were treated with oligopeptide FLPNF and dexamethasone, either separately or in combination. Proliferation of INS-1 cells in each group was assessed with CCK-8 assay and the insulin secretion stimulated by glucose was detected by ELISA. The apoptotic condition of the cells was observed and assessed with TUNEL and the apoptosis rate of each group was detected using flow cytometry. The expression of major target protein molecules related to apoptosis and Glut2 was detected by Western blotting analysis. Results Dexamethasone inhibited the growth of INS-1 cells in the group treated with dexamethasone. Cell damage was obvious with observable nuclear shrinkage and nuclear rupture. In addition, apoptosis rate was found to be 40.6%±2.4%. The expression of the apoptosis-related protein Bcl-2 and Glut2 was significantly reduced, whereas that of Bax and caspase-3 was significantly increased. After the combined treatment of oligopeptide FLPNF and dexamethasone, the results were reversed, and the apoptosis rate declined to 27.2%±2.0% (P < 0.001), cell morphology was improved, and the expression of apoptosis-related protein molecules of islet cells and protein Glut2 was significantly improved. Conclusion FLPNF has the ability of protecting islet cells from dexamethasone-induced apoptosis and improving the glucose-stimulated insulin secretion of islet cells.